The Lopi Leyden is a cast iron stove with pleasing detail incorporated into the casting and curved cast iron legs. 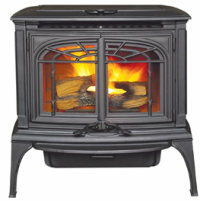 Rated to heat an area of 2,250 square feet, this elegant woodburner style stove will produce 45,100 btu. Lopi use the cast iron front and sides of this stove, as well as the twelve tube heat exchanger and a quiet 165 cfm. blower to efficiently transfer heat to the home. Extremely efficient, at 85%, the Leyden has an emission rate of 0.9 grams per hour. Window Size 16.5 in. by 10.5 in. Rear Vent Height 17.25 in. The Lopi Leyden has a 'maintenance required' diagnostic system on the control board. If you would like to leave a review of the Lopi Leyden pellet stove, please use the form on the contact page.